I was about 23, teaching 5th grade in a diverse Philadelphia public school. 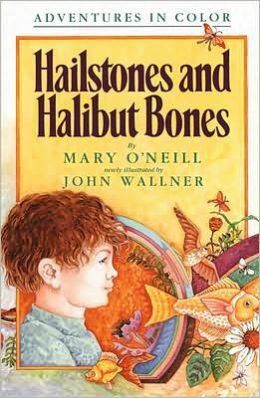 Hailstones and Halibut Bones, the beautiful book of color poetry that inspires kids out of mediocre writing, sparked lovely poems in my own students. (It is the most recent edition that offers vibrant pictures). The contagious delight the kids took playing with words that detailed everyday sensory experiences prompted a color poem out of their teacher too. It was a special experience for us to write together. Once the brainstorm page filled up, the poems wrote themselves. We divided a sheet of paper into six rows, each representing a physical sense with the addition of one for emotions (Sight, Hearing, Touch, Taste, Smell, Feeling). Then simply named observations and experiences in their category. White: cotton candy for taste, blank coloring page for touch, chocolate for taste. Writers young and old will hear “show, not tell” or “paint a picture,” but may not quite know how to go about it. Sensory details paint clear verbal pictures, not unlike a 3-D presentation that appears to move toward the reader. They serve as a powerful writing tool for the grade school student as well as the blogger and the author on his fourth novel. plays a note of simplicity. This entry was posted in Arts, Poetry, Writing and tagged Communication, Creative Writing, English Language, Homeschool, Homeschooling, Poem, Poetry, Words, Write, Writer, Writing Process, Writing Technique, Writing Tips. Bookmark the permalink. I loved it! Brings back many memories, especially the glob of frosting someone took, that would have been me!! Tell me about it: oh, back to the simple days! At six, my boy still delights in the most mundane pleasures, silly faces, CHASE. Leaves me hopeful that he won’t outgrow me too fast. At least writing transports us back…. =) The images I reexplored reversed time for a moment – at least, for me. So often we forget sensory details. Great reminder! Thanks for the book lead; I ordered it from the library for my kids. Looks perfect for summer with all its joyful sensory opportunities! A great post and some great ideas. I may have to do this with my kids. Thanks for sharing! You’re in my latest post, Why We Read. Oh how pretty! What a great class project. You definitely had some girls in that group. =) Both boys and girls enjoyed it. It’s a lovely book you can get through the library. Be sure to ask for the latest version, for the colored photos.